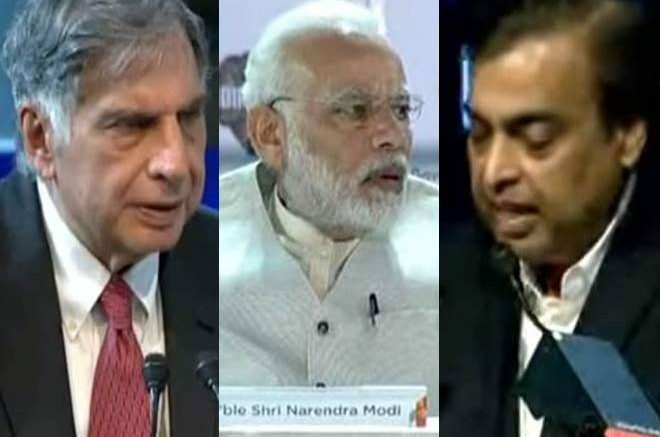 Prime Minister Narendra Modi on Sunday opened the Magnetic Maharashtra summit in the presence of national and international business leaders including Ratan Tata, Mukesh Ambani, Anand Mahindra and Richard Branson in Mumbai on Sunday evening. “I am pleased the state government has decided to make the state the country’s first trillion dollar economy. In Chhatrapati Shivaji’s place, it is not difficult to achieve any goal,” the Prime Minister added. Putting the focus on infrastructure, business tycoon Anand Mahindra asked Chief Minister Devendra Fadnavis what his dream was for Mumbai and said industry would stand by him to fulfil that dream. “This state has a ‘brahmastra’. Mumbai is a jewel in your crown. But it’s a double edged sword. If the city begins to drown under its weight and you mismanage it’s growth, then you may just as well turn away investors,” he said. Mukesh Ambani also announced Reliance will establish India’s first integrated industrial area for the fourth industrial revolution in the state of Maharashtra. “Reliance will invest with a coalition of global companies more than Rs. 60,000 crore over the next 10 years in this collaborative initiative,” Mr Ambani said. One announcement that generated a lot of buzz came from Richard Branson, Chairman of Virgin Group. “India can soon have an operational Hyperloop reducing the travel time to cover the 140-km distance between Mumbai and Pune to 14-25 minutes from 3-4 hours at present,” he said drawing a cheer from the crowd. Be the first to comment on "Magnetic Maharashtra summit: PM Modi praised state govt. initiative to make India’s First Trillion-Dollar State"